The railroad played an important role in the development of Ray City. It spurred the development of businesses like the Mayhaw Lake Resort and Luckie Lumber Mill (later Clements Lumber Company). It provided farmers with access to distant markets, and the people of Ray City with transportation to cities and connecting destinations. By September 1908, the G&F Construction Company was nearing completion of the Georgia and Florida Railroad. The section running from Nashville, GA via Rays Mill (now Ray City, GA) to Valdosta was the last remaining track to be laid. A contract was let out to construct a “neat and commodious” train depot at Rays Mill at a cost of $1500 dollars. The contractor was Richard A. Whitehurst, of Valdosta, GA. In addition to the depot, the railroad built a number of section houses at Ray’s Mill. These were homes for railroad employees and their families. A big wooden water tower was constructed just south of Main Street on the east side of the tracks to provide water for the trains. Georgia and Florida Will Begin to Operate Trains Between Nashville, Ga., and Madison, Fla.
Valdosta, Ga., September 5. – (Special.) 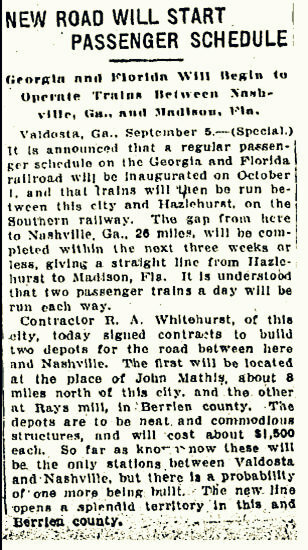 It is announced that a regular passenger schedule on the Georgia and Florida railroad will be inaugurated on October 1, and that trains will then be run between this city and Hazlehurst, on the Southern railway. The gap from here to Nashville, Ga., 26 miles, will be completed within the next three weeks or less, giving a straight line from Hazlehurst to Madison, Fla. It is understood that two passenger trains a day will be run each way. Contractor R. A. Whitehurst, of this city, today signed contracts to build two depots for the road between here and Nashville. The first will be located at the place of John Mathis, about 8 miles north of this city, and the other at Rays mill, in Berrien county. The depots are to be neat and commodious structures, and will cost about $1,500 each. So far as known now these will be the only stations between Valdosta and Nashville, but there is a probability of one more being build. The new line opens a splendid territory in this and Berrien county. 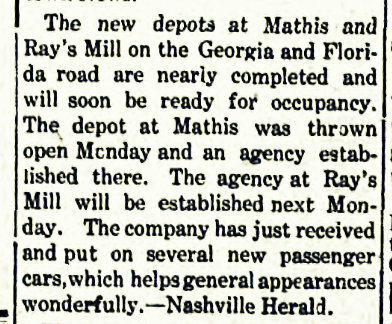 By November 9, the depot at Rays Mill was ready to open. Train depot at Rays Mill, GA was ready to open November 9, 1908. The new depots at Mathis and Ray’s Mill on the Georgia and Florida road are nearly completed and will soon be ready for occupancy. The depot at Mathis was thrown open Monday and an agency established there. The agency at Ray’s Mill will be established next Monday [Nov 9, 1908]. The company has just received and put on several new passenger cars, which helps general appearances wonderfully. – Nashville Herald. Mahlon Parker Bowers was later a Railroad Agent for the G&F Railroad at the Ray City,GA depot.